The Zeppole are similar to a fried donut and the first one was described in 1837 by the famous Neapolitan gastronome Ippolito Cavalcanti, Duke of Buonvicino. 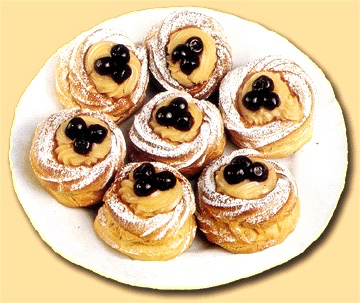 However it is believed that the Zeppole has its origin from ancient Rome in the celebrations for the pagan deities. These are found later also in the Middle Ages, which were prepared in convents. Some other dates back it even to ancient Egypt. The Zeppole di San Giuseppe are tasty pancakes of soft paste, baked or fried, with the a heart of custard accompanied by black cherries and are dusted with powdered sugar. They are made to celebrate San Giuseppe (St. Joseph) in March the 19th. According to the New Testament, he was the husband of Mary and the putative father of Jesus. Once prepared the celebration of St. Joseph, today is easy to find them all year. The origin is disputed between Campania and Sicily, but are found throughout southern Italy and beyond. In addition to the variant with cream, have spread the Zeppole made with the dough of the krapfen, with the potatoes, or with wheat flour, water and salt. Tasty, fragrant and rich, what is certain is that should be considered between the “illegal” foods for their taste absolutely delicious, which makes them irresistible.